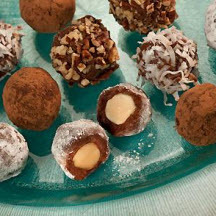 A surprise treat is sweetly tucked in the center of these chocolate truffles. Beat butter in large bowl until creamy. Stir together powdered sugar and cocoa; add to butter mixture alternately with whipping cream and vanilla, blending well. Refrigerate until firm. Shape small amount of mixture around desired center; roll into 1-inch balls. Drop into desired coating, turning until well covered. Refrigerate until firm. Variation: Add 1/2 teaspoon rum extract, decrease vanilla extract to 1 teaspoon.